If you feel you would be suitable for any of the following research projects, or if you are interested in hearing more about research that the PCSC Program is doing, please contact Olga Arsovska or Eugenia Wu at 604-875-4111 ext. 62338 or at oarsovska@prostatecentre.com or ewu@prostatecentre.com. PC360-IS – Prostate Cancer 360º – Information Systems This involves the a registry of prostate cancer patients across Canada. Participation involves responses to the electronic Patient Reported Outcomes (ePROs), completed at each urology clinic appointment, being anonymized and uploaded to the registry database, along with diagnosis and treatment information. Who: Patients who have completed primary treatment for their prostate cancer within 3 months of completing ePROs at clinic. PC-SCP – Prostate Cancer – Survivorship Care Plan This is a randomized control trail that aims to develop and evaluation a facilitated electronic Prostate Cancer Survivorship Care Plan (SCP). Participants are randomized to either receive a personalized SCP, created at a one-on-one appointment with a nurse, or to usual care. Participants from both groups will be asked to complete questionnaires at 6- and 12-months. Who: Participants in the PC360-IS Registry who have had treatment within the last 6 months. Overall, this study represents initial steps in uniting the country in sharing programmatic resources, data, expertise, and enthusiasm to transform survivorship care for men with prostate cancer and their families. Purpose: This project aims to improve the physical and mental health of men treated for prostate cancer by establishing a global registry. The overarching aim of this project is to significantly improve quality of care and the attendant patient­centred outcomes in men with localised prostate cancer. Who: All newly diagnosed prostate cancer patients who have completed electronic Patient Reported Outcomes (ePROs) at their urology clinic visit. What is Involved: Responses to the ePRO questionnaires will anonymized and uploaded to the global registry, along with diagnosis and treatment details. Purpose: TEMPO is a dyadic, Tailored, wEb-based, psychosocial and physical activity self-Management PrOgramme that aims to provide coping-skills training and an in-home exercise program to meet the needs of men with prostate cancer and their caregivers. Who: Men who have a confirmed prostate cancer diagnosis within the past 24 months and who have undergone active treatment. Eligible men must also have a primary caregiver who is willing to participate in the study. What is involved: Patients and caregivers will be asked to use TEMPO for a period of 7-10 weeks. This includes educational materials, videos, and interactive worksheets to help manage the challenges they face as a result of cancer. Throughout this period, the research coordinator will conduct a number of interviews to obtain participants’ feedback on TEMPO. Purpose: We are interested in evaluating different treatment options for improving intimacy in couples after prostate cancer treatment. Who: Couples in which (at least) one member of the couple underwent treatment for prostate cancer. What is involved: Couples will be randomized to one of three groups: 4-weeks of a mindfulness-based group therapy program, 4-weeks for a cognitive behavioural therapy (CBT) group therapy program, or 4-weeks of no treatment (“control” group). both members of the couple will also complete 3 sets of online questionnaires which take approximately 20-30 minutes. Some honoraria will be provided to participants. Purpose: This is an evaluation to determine the effectiveness of the Prostate Cancer Supportive Care (PCSC) Program’s group therapy program, Living with Prostate Cancer (LPC). Who: Prostate cancer patients who are willing to attend the “Living with Prostate Cancer” group therapy sessions from the PCSC Program. To be able to participate in LPC groups, men must have recently received a diagnosis of PC Stages 1 to 3, or have recently been recommended to undergo a form of treatment following a period of active surveillance. What is involved: Participants will be asked to complete a series of questionnaires about their experience with the LPC program at various time-points. Principal Investigator: Dr. Stacey Elliott, Clinical Professor, Departments of Psychiatry and Urological Sciences, UBC; Research Investigator with VCH Research Institute. Purpose: This project aims to assess the patient acceptability of, adherence to, and satisfaction with a new tool (SHRAP), whose objective is to assist patients/couples in their pathway to sexual health adaptation after prostate cancer treatments. Who: Single or partnered men who have been diagnosed with and received primary treatment for Stage I-IV prostate cancer as well as their partners, and have attended or are scheduled to attend their first visit with a clinician of the Sexual Health Service (SHS) for the Prostate Cancer Supportive Care (PCSC) Program. What is involved: Online questionnaires approx. 1 week, 1 month and 2 months post-receiving the SHRAP. Participants receive a gift card afterwards as a thank you for participating. Principal Investigator: Dr. Dr. Larry Goldenberg, Professor Department of Urologic Sciences, UBC Research Investigator with VCH Research Institute. Purpose: This project aims to assess OOP expenses borne by patients who chose to access a supportive care program for men with prostate cancer and their partners. Who: Men who are diagnosed with PC (stage I-IV; pre- or post-treatment) and enrolled in the PCSC Program. What is involved: One time questionnaire. Purpose: To collect saliva samples from men who are currently or were previously on Active Surveillance to try and identify genetic factors that could suggest how aggressive their prostate cancer could be. Who: Prostate cancer patients who currently meet or have previously met the traditional active surveillance criteria. What is involved: Participants will be asked to provide a saliva sample which will be used for DNA analysis. Purpose: To help determine if a structured exercise program for prostate cancer patients prior to surgery is feasible. Who: Prostate cancer patients who are considering a radical prostatectomy. Purpose: This study aims to evaluate if the ARES(TM) device can be used to study the effects of Androgen Deprivation Therapy (ADT) on the sleep patterns of prostate cancer patients. Who: Prostate cancer patients who are starting ADT, and plan to be receiving treatment for at least 6 months (with or without radiation therapy). What is involved: Participants will be required to wear the ARES(TM) device at home to record their sleep at 3 time points: before starting ADT, and at 3 and 6 months after starting ADT. Participants will also be asked to complete a short questionnaire at each time-point. Body parameters (including weight, height, waist and neck circumferences) will also be measured. At the end of the study, participants will be asked to complete an exit phone interview to learn about their experiences using the ARES(TM) device. Purpose: This was an evaluation to assess if by attending the educational session “Introduction to Prostate Cancer Treatment & Primary Treatment Options”, distress is reduced in men and their partners. Who: Recently diagnosed prostate cancer patients who were willing to attend the “Introduction to Prostate Cancer Treatment & Primary Treatment Options” education session from the PCSC Program. What was involved: Participants were asked to complete a questionnaire before and after the session. Purpose: To determine if nutrition education alleviates the uncomfortable side effects of prostate cancer treatment and reduces further cancer risk. Who: Prostate Cancer patients and their partners who were interested in participating in a cooking class study together. What was involved: Participants were asked to attend six weekly two-hour group classes taught by a nutrition educator and a professional chef, and to complete questionnaires before and after the intervention. Purpose: We have developed a peer navigation program where trained peer ‘navigators’, who are either prostate cancer survivors or their caregivers, will help prostate cancer patients and caregivers navigate their journey through cancer care, from the point of diagnosis to treatment and beyond. Who: Prostate Cancer patients diagnosed at least four weeks ago, or their caregivers who are able to use the internet for basic tasks. What was involved: Participants were matched with a peer navigator – either man with prostate cancer (for prostate cancer survivors) or a caregiver (for caregivers of prostate cancer patients). The peer navigator provided emotional, practical, and informational support. Participants were asked to complete questionnaires throughout the study. Purpose: This study aimed to assist us in providing better recommendations for prostate cancer patients on how to manage the side effects of ADT, and maintaining a strong relationship with their partner while on ADT. Who: Prostate Cancer patients and their partners who participated in the PCSC Program’s ADT Educational Program wre eligible to take part in this evaluation. What was involved: This research study involved completing a set of questionnaires before the first session of the ADT Educational Program, and two months later. 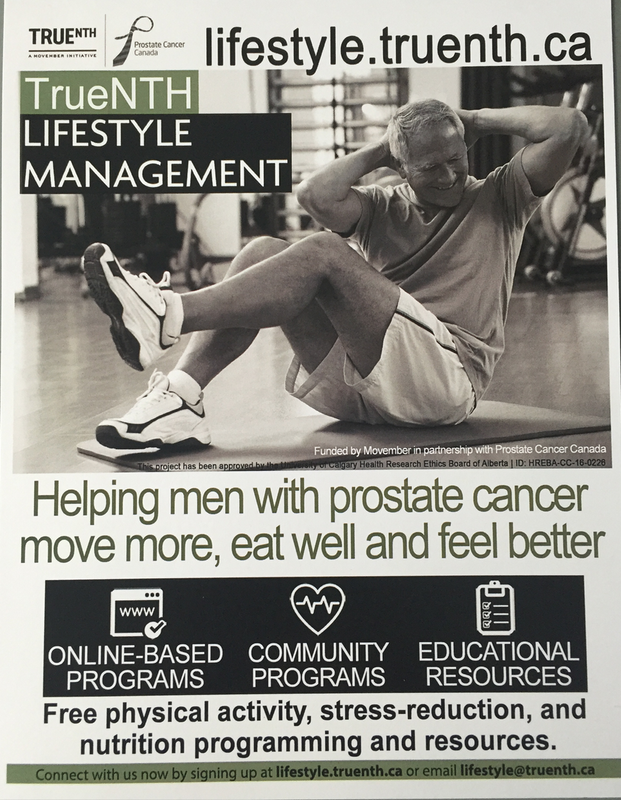 Purpose: This study aimed to provide a wellness intervention for prostate cancer survivors – a multi-faceted health care program that will improve quality of life and recovery post treatment. Who: Prostate cancer patients who were medically safe to engage in light to moderate exercise. What was involved: A 12-week exercise and education program whereby participants underwent a baseline assessment and then attended three supervised exercise sessions per week with bi-weekly education seminars. The Movember Foundation is a charity tackling men’s health on a global scale, year round. They address some of the biggest health issues faced by men: prostate cancer, testicular cancer, and mental health and suicide prevention. The Michael Smith Foundation for Health Research (MSFHR) empowers British Columbia’s best and brightest health researchers to pursue world-class innovation and stretch the bounds of what health research can achieve. Vancouver Coastal Health Research Institute (VCHRI) is one of Canada’s top-funded health research institutes. Our research discoveries have improved quality of life and changed how health care is delivered and received.